AFTER a decade of turning Coles around, Wesfarmers will demerger their $20 billion supermarket business. Retail expert Gary Mortimer tells Australian Food News why Wesfarmers is cutting Coles loose, and what’s at play in the move in a must-read three-part series starting today. The new and separately ASX-listed company will include over 800 supermarkets, nearly 900 liquor stores, 700 service stations and 88 hotels. While Wesfarmers will have private equity groups and international supermarkets taking great interest, the next several months will see significant investment in stores, loyalty programs and a newly-appointed leadership team. The aim will be to put to market the most attractive product. The Wesfarmers group currently owns a diverse range of business in retail, chemicals, energy, fertilisers, safety products and coal. There is a strategic reason for this. Unlike Woolworths that essentially runs a ‘retail company’, the conglomerate model allows Wesfarmers to spread the risk for themselves and their investors. If coal prices fall, they lean on their retail companies. When their hardware business loses $1 billion in the UK, they can rely on their industrials and energy companies to deliver a $915 million in profit [See page 45 of their 2017 annual report] Wesfarmers is very good at entering and exiting markets, and identifying opportunities – and getting into food and groceries a decade ago was a smart move. These two pie graphs explain why Wesfarmers is demerging their Coles business. As it stands, Wesfarmers has 61 per cent of working capital invested in a business that is contributing 34 per cent of the conglomerate’s profit (EBIT). In simple terms, as a property investor, would you continue to leave 60 per cent of your cash in one property, if it only returned 30 per cent value to your overall portfolio? Wesfarmers saw an opportunity to enter the food and grocery sector when they purchased an ailing Coles in 2007 and pulled together a new management team, led by Ian McLeod. However, that was over a decade ago and the sector has changed dramatically in relation to intense competition, the growth of discounters like Aldi and the emergence of price conscious shoppers – who simply shop across multiple brands of supermarket each week. Earlier this year, Fred Harrison, chief executive of Ritchies, Australia’s largest chain of independent supermarkets, called for an end to the price wars. At the same time Coles signalled a move away from a purely price focussed strategy. Metcash’s half-yearly results attest to the negative long-term consequences of the drawn out price wars, delivering loss in their food and grocery business. With the entry of German discounter Kaufland imminent, and possibly their other business, Lidl, it is suggested, Wesfarmers are getting out of the food and grocery sector, which is projected to become even more competitive over the next five years. 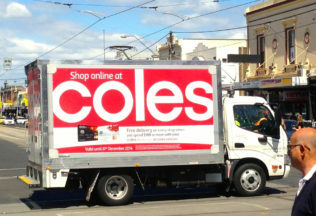 In the second instalment of this analysis, on Monday, learn how Wesfarmers will maintain a strategic interest and influence in Coles using a new loyalty program and the data it brings. Snack Brands’ Thins and Oporto Chicken have released a new chip flavour.